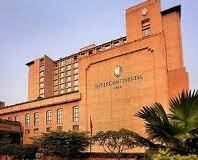 Delhi having best five star hotels Intercontinental Hotel is one of them. It is best and luxurious hotel in Delhi. An elegant oasis surrounded by the bustle of an emerging commercial hub. You will find India’s rich and varied culture, as there’s the famous Lotus Temple just outside the door and Humayun's Tomb; the National Museum, New Delhi and the Ambawatta Complex and Connaught Place shopping within a few kilometres. It is located amidst the pulsating commercial and shopping hub of New Delhi. Hotel is ranked amongst the premium 5 star hotels in India. If we talk about its structure inspired by the designs of the eminent British architects, personifies a stirring blend of modishness and elegance. In addition to the luxurious rooms and suites, the hotel forwards amazing dining outlets and a multitude of facilities for entertainment & recreation. Visitors will get extensive range of business and essential amenities and services, ensures a memorable stay for holiday makers, as well as business travelers. Here you can truly experience a cosmopolitan culture in its sophisticated atmosphere and very alert and polite services that include 24-hours dedicated room service. The hotel has a beautiful building with a very charming exterior in marble and concrete. The restaurants inside this hotel are second to none and provide the most wonderful dining experience. There is also a wide selection of the finest wines and other drinks to accompany meals. It is a modern and trendy hotel with lots of innovative features like fast Internet facility in the rooms and exclusive Club Inter-continental floor. Standard Rooms: These rooms, with attached modern bathroom, are tastefully furnished with all amenities and a dedicated room service. Bathrooms are fitted with beautiful bathtub and all modern items. Luxury Suites: These are special elite suites comprising of a bedroom plus a living room and study. They are luxuriously furnished and provided with all modern equipment and comforts. Singh Sahib: A regal eatery that serves North Indian and Punjabi cuisines. Empress of China: A Chinese restaurant, offering lip-smacking flavors. Blooms: A fine restaurant that offers extremely delectable Japanese cuisine. Tea Lounge: A place to enjoy hot brew and light meals in a serene setting. Lounge and Bar: A place to rest over a selection of premium spirits & cocktails. Services like Banquet Facility, Bar Facility, Beauty Parlor, Business Centre, Car Parking, Car Rental, Conference Facilities, Courier Service, Credit Card Facility, Doctor on Request, EPABX enabled telephone facility, Fax on Application, Flower Shop, Desk, Gift Shop, Gymnasium, H/C Running Water, Internet Facility, Laundry Service, Mini Fridge, Mobile Rental, Money Changer, News Stand, Newspaper, Restaurant, Room Service, Safe Box in Room, Satellite TV, Secretarial Service, Travel Desk Service, Swimming Pool and much more.